Prospecting with posture is not the same as being a jerk or being rude, or insulting people. It is having self-confidence. It is knowing who you are and where you are going. It is knowing that you are unstoppable! From Google: posture is a particular way of dealing with or considering something; an approach or attitude. For our purposes, prospecting with posture is having a conviction or belief in yourself and living with the attitude of being a leader. You live by the philosophy of “lead follow or get out of the way” and implement it into your daily life. You are the leader that these people are looking for. People are hungry for leadership. Prospecting with posture means you know where you are going, you have a plan to get there, you will get there and there is no doubt you will succeed. It is having that conviction and positive attitude. Most people are flopping around in life with no direction so, your mission is to provide that direction for them. Their biggest struggle is finding what channel “Dancing with the Stars is on” Remember the average American watches five hour of TV every day. So really prospecting with posture is simple, I know where I am going and I am offering you the chance to go there with me. It’s ok if you don’t see the vision that I see or if you feel it isn’t for you. We have all heard the saying that “no” means, “next one” or frequently means “not now”. A great strategy is to have more than a few people to talk to. The more people you have in your cue, the less likely you are to feel panic if someone says “No” to your opportunity. Prospecting with posture becomes easier when you have a lot of people to talk to…. Remember when someone tells you “No” it often means “not now”. It means they are distracted, busy, or have other issues of higher importance going on in their life and are not ready for you. Many times people who are not ready now will call back later. So treat them with respect now, honor their decision now and move on now! It’s often said that the fortune is in the follow up. We’ll come back to that later but first let’s look at the 7 key points of prospecting with posture. 1.0 Have a deep conviction and belief in yourself. Have goals, both short term and long term goals. Why are you an entrepreneur? What is going to motivate you to get out of bed. Understand and believe that the potential here is incredible. You can have anything you want. Where or how else can you start your own business for as little as a couple hundred dollars with all the training and support that we have and still have the possibility of making 6 figures or more in a few years? Make your goals big and write them down… It has been shown that written goals are far likelier to be met than wishy washy, I know what they are, in my head goals. You must write your goals down and once again, make them big. This is not an exercise in goal setting but goals need to be measurable, achievable, believable but stretchable. What I mean by that is, if your goals don’t stretch you and, frighten you a little, maybe you need to rethink them? One exercise you might consider is to imagine you are near life’s end and are looking back on the movie of your life. What do you see? What have you accomplished? Now go for it! But I digress, let’s get back to prospecting with posture! Don’t be a wet noodle! Don't whine, “I had 20 no’s today and I don’t know what to do!” Awesome. You are on your way! If you had 20 no’s today that is friggin awesome. Go get 20 more tomorrow. Better yet, do a little role playing, practice, ask someone to critique you, get in front of a mirror, play with your self (no not like that) practice and you will get better. Many of you probably know Ray Higdon. When Ray was in personal foreclosure, his goal was 20 no’s per day. If you haven’t read the book, “ Go for No! : Yes Is the Destination, No Is How You Get There” by Andrea Waltz and Richard Fenton, I highly recommend it. You have to give energy to people and lift them up. Remember most people stay in their comfort zone but, they are looking for a leader to show them the way. Now, they may be afraid to follow but, that’s not your problem. You believe in you, you believe in your product or service and you believe in the system so have the confidence that it will all work for you. Once again you have the chocolate chip cookie and everyone wants a chocolate chip cookie. You must believe that. You must absolutely believe that you have something that is going to help people and you msut approach it from a service mentality. Yeah, yeah, yeah I’ve heard all this before! Really? Do your results reflect a knowing or just a hearing? Often we have heard something many times but we have not yet assimilated it into our daily lives and made it an integral part of ourselves. This goes back to mindset. The conscious mind may have heard it but, something deep inside is putting on the brakes and holding you back. You may want to consider my Ultimate Vision Workshop. Have a script, don’t read the script but have one and practice it. Practice in front of a mirror. Try role plaing with a friend or a mentor or your upline. Practice prospecting with posture with a colleague. Don’t get caught in get-ready-itis mode, your desk is organized and you don't need another course or more files and another book to read or a YouTube video to watch. Just get out there and do it but. know what you are going to say. Have a workspace and keep it organized so you can find your stuff. When getting ready to prospect with posture, remember to breathe and if necessary, jump around a little to get some blood flowing. This is especially important if you are nervous. If you are feeling some anxiety, that will restrict blood flow and cause a lack of oxygen to the brain which then causes more anxiety, so breathe! And ladies, wear your high heels haha (a tip from Lisa) but seriously, dress for success. You might be at home but lounging around in your underwearis not prospecting with posture. Have an attitude and dress for occasion. You are looking for people who qualify for your time, don’t be arrogant or hostile but, be positive and if necessary, assertive. Place value on yourself and your time. It is a game of attitude and you are in control. Remember you have the advantage. Even if you have only been doing this for a short time, you have been doing it longer than your prospect. But do have stories. Facts tell stories sell! We have a friend who lost 45 pounds in 6 months using our shakes and other products etc. A final thought here is this is the game of your life so get good at it. Practice, practice, practice! Remember, people like to buy, they just hate to be sold and they hate losing out. Some repoire building is necessary but be careful about carrying it to an extreme and falling into the friend zone. Especially on social media, and especially on Facebook, it is a trap to fall into to build repoire forever and never get down to the business. You will ultimately end up making friends with some, if not all, of the people who join you but, that is not the primary objective. Focus on results not excuses. How many people do I have to talk to? Well what is the result you want? Talk to however many as it takes to get the result. In the beginning your numbers will be outside the industry averages but in time as you get better your numbers will improve. Qualify people for your time and their desire but not for dollars. And remember you get paid whether they say yes or no – think about that! How is that Len? Let me tell you. As an example let’s say you have to talk to 10 people to sign one person up with a $499 pak. and you make $100. Now let’s introduce another concept, the lifetime value of a customer. So you talk to 10, sign up 1 and that person gets on autoship and stays with you for life. How much is that worth? Remember we are not begging, convincing or chasing. A person convinced against their will is of the same opinion still! Always ask for the next commitment. When can you watch the video? When can you…. and get a commitment. And set the follow up schedule. Always be scheduling the next exposure whatever it is in your funnel. But you must follow up also. Be professional. Set a follow up appointment and KEEP IT. We have probably all been guilty at some time of forgetting a call or missing an appointment. Use a calendar such as google calendar. Please, no yellow sticky notes all over the computer screen lol. That might be a hoot and a holler but it is not a CRM or a system to foller. People will watch what you do and remember, you are potentially training a future team member so be sure to show them what you expect them to do in the future when they are part of your team. In network marketing the most fundamental thing you need is duplication so keep it simple from the start. Remember the old saying, “Ask and thou shall Receive”. If you don’t ask for the order you will not get the order. My favorite question is , “So Sally, based on what we have discussed and you told me, it sounds like you are ready to get started making that extra money today”! OK one of two things is going to happen. Either Sally is going to say, “ why yes I am! “ in which case you say great. Fire up your computer and let’s do this thing. Personally I always want to walk them through the sign up process. Do not leave them to fuddle through it on their own. The other possible outcome is Sally says, “No!” and gives you a reason. Now we are not going to go in depth to exception handling, but I will give you just a couple ideas. Money: I always start with the most expensive option. If they say I don’t have the money for that I ask how much they do have? So maybe they have a couple hundred in the bank. Great we can back down to the less expoensive option or we can schedule when thay can have the money available. I need to speak to my wife (husband): I probably didn’t mention this before because we didn’t do scripts tonight but you should already know if there is a significant other who will be part of the decision and have already involved them. I don’t have time: Point out that the average person watches five hours of TV every day in these United States. We have had people build a successful business from their car with a cell phone on their lunch hour so.. If they say “no”, a great strategy is to ask them if they mind if you check back in with them in a few months and see how they are doing? Then do it! Once again a good CRM will help with this scheduling. Prospecting With Posture it will make you money! 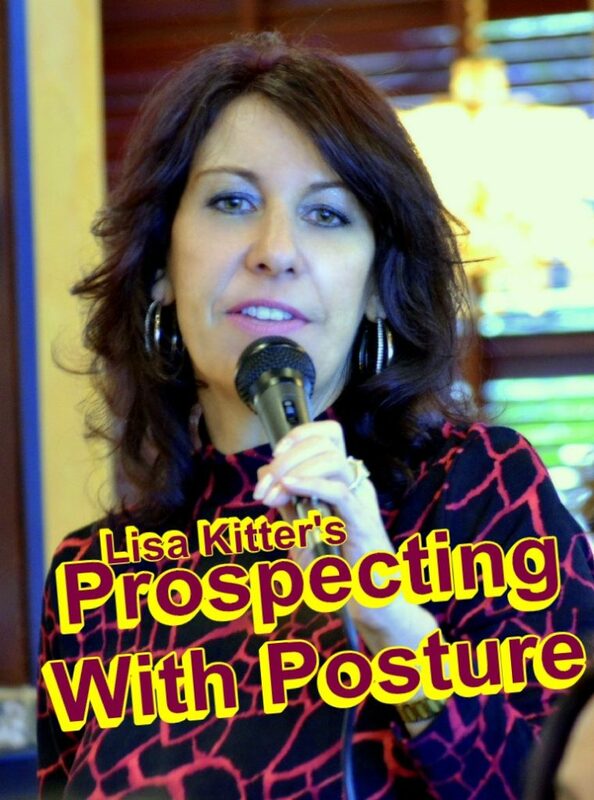 Did This Help You learn about “Prospecting With Posture – The Teachings Of Lisa Kitter” If yes, I would greatly appreciate it if you commented below and shared on Facebook.